Welcome to Slow Cooker Week, in which The Takeout uses its favorite cold-weather kitchen appliance in the dead of summer. At The Takeout, we don’t view “garbage” as pejorative. To us it’s analogous to lo-fi homeyness, the ability to dump ingredients into a single pot, turn on the power source, and allow heat to perform its sorcery. Ever since I discovered the culinary car crash that is the Mississippi Pot Roast, I’ve been inspired to make garbage. I’d channel my inner-Paula Deen (minus the ethnic slurs), daydreaming of wild, fantastical combinations to throw together in my slow-cooker. Then one day, rather than just thinking about it, I actually set out to do it: to create the next Mississippi Pot Roast. What I found in cooking these combinations was the final product all tasted roughly the same. Once served alongside rice or noodles, any subtlety of flavor disappeared into the background of “seasoned beef cooked in its own juices.” Look, I’m not winning any cookbook awards here, but it was still pretty dang satisfying. There was one combination, however, that stood out. It had spice, savoriness, a tinge of exotic flavoring, and it was rich and unctuous. The idea was inspired by my love of Vietnamese pho (pronounced fuh? with an upward intonation), with a beef broth that hinted of cloves and nutmeg. From there, I built on the idea that onion soup would pair nicely, jarred pickled jalapenos would provide the requisite kick, and butter just makes everything tastier, right? So here it is, my humble attempt at garbage. I like it quite a bit. Add everything into a slow cooker and turn on to the low setting, and cook for at least five hours. 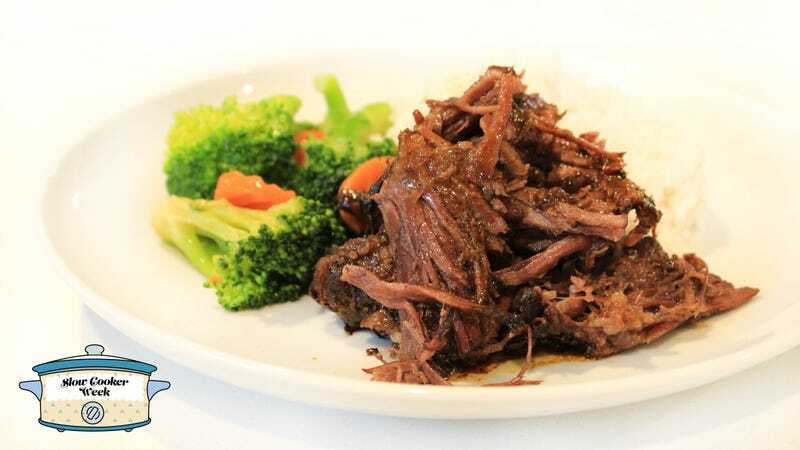 When it’s done, you can shred the beef and serve it with the leftover dried noodles, or with rice and steamed vegetables. Got any unexpected and unexpectedly delicious slow cooker combinations? Let us know in the comments section below.